EMS Plastic Boxes are in demand! Whatever your storage needs, there's an EMS Plastic Box that's perfect for you. Molded from polystyrene for optimum clarity and rigidity. They come in a variety of shapes, styles, and sizes. They have two equal dimensions for length and width. The "squares" are available in a variety of sizes in both friction fitting lids and hinged-lids with snap locks. Finally – the right shape for all those long and narrow items. Friction fitting lids or hinged-lids with snap locks available on a wide selection of boxes depths and sizes. Super for storing many items thatjust don't seem to fit in square orrectangular boxes. 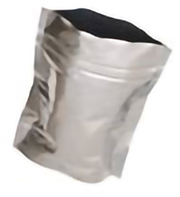 Supplied withfriction-fitting lids. Especially designed for storing little pieces that constantly are misplaced. Ideal for specimen blocks, apertures etc. Organize singular or groups of items in individual compartments. Stored items stay separately and are readily visible at all times. Extra-thick wall construction permits containment of heavy objects; protects delicate items. Organizing singular or groups of items in individual compartments. Stored items stay separately and are readily visible at all times. Extra-thick wall construction permits containment of heavy objects; protects delicate items. A compact, solid fiberboard Tray Box makes instituting a plastic box/sample storage system more convenient and efficient. To form a Tray Set, use plastic boxes for specimen storage, and then organize boxes within the fiberboard Tray Box. These sets eliminates misplacement or inadvertent sample loss, and allows for rapid retrieval of specimens. The tray boxes are available with or without accompanying plastic boxes. Constructed from white pasteboard; match box style and rectangular in shape. Available in different sizes to meet all of your needs. It is ideal for the storage of specimen blocks and many small items. 64326-01 2⅛ x 1⅛ x ⅝"
(54 x 28 x 16 mm) 2¼" x1¼" x ¾"
64326-02 2 x 1¼ x 7/16"
(51 x 32 x 11 mm) 2⅛ " x 1-7/16" x ½"
64326-03 2-5/16 x 1-5/16 x 13/16"
(59 x 34 x 22 mm) 2½" x 1½" x 1"
64326-04 2½" x 1½" x ⅝"
(63 x 38 x 15 mm) 2⅝"x 1-11/16" x ¾"
64326-05 2-9/16" x 1-9/16" x 1"
(65 x 40 x 25 mm) 2¾" x 1¾" x 1⅛ "
64326-06 3 x 1¾" x ¾"
(76 x 43 x 18 mm) 3⅛ " x 1⅞" x ⅞"
(72x47x28 mm) 3" x 2" x 1¼"
64326-11 3⅛ x 2-1/16" x 1¼"
(80 x 53 x 31 mm) 3¼" x 2¼" x 1⅜"
(82 x 51 x 22 mm) 3⅜" x 2⅛" x 1"
(87 x 58 x 28 mm) 3½" x 2½"x 1¼"
(88 x 60 x 34 mm) 3½" x 2½" x1½"
Made from white recyclable board. Has a partition insert and removable lid. Ideal for filing small samples. A round seamless tin with a friction fit lid. Low form, flat bottoms. White label on lid. These boxes are ideal for specimen or small item storage. • Boxes - Made from polypropylene, envelope shape, available with or without an inner frame. These boxes are the safest way for mailing or storing fragile samples. They are impact and shock resistant With a living-hinge, opaque-clear, reusable and recyclable. The boxes are available in many sizes and styles to fit your needs. Closing Clips and Security Seals are also available as an option. • Vials – are made from polystyrene and they are tough and crystal clear and come with a friction lid. 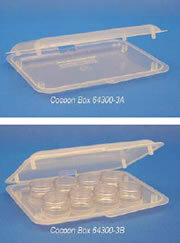 Cocoon Boxes are also available to accept these vials for safe storing and/or mailing valuable samples. Large size with an inner frame. The yellow box (BE6Y) is accepted by the US Postal service AS-IS. No need for envelopes or other containers. This box is also available in clear (BE6C). BE8 comes with an inner frame. BE8A - The-Envelope-Mailer - comes without the inner frame. BE9 comes with single inner frame. BE9A comes with two compartments and BE9B comes with 4 compartments. Vial DB10 is designed for the Cocoon Box BE4B (64300-4B); Vial DB20 is designed for the cocoon Box BE3B (64300-3B); and Vial DB30 is designed for the Cocoon Box BE3D (64300-3D). Used to secure the cocoon boxes. Clips snap together to keep cocoon boxes securely lock.